My friend, Horst Friedrich of Wörthsee, Germany, recently sent me a issue of Bipedia, asking me to respond to an article by Ulrich Magin discussing fossil footprints. I’m personally involved with the print found by Bill Meister, so while this isn’t a first-hand report, it is second-hand, so perhaps I can correct some of the mistaked opinions about this. My experience has been that most critics use information that has already passed through the hands of 10 to 20 authors, with each one adding mistakes to mistakes by others, until no truth is left. At least I can provide a good photo, and tell what I know about it. The other prints reported in Forbidden Archeology are not known to me. I’m also auspicious of many of these, but the information available is not good enough to judge. I do know that many natural formations can be mistaken for footprints and other human activity, I’ve found many such things myself, which prove to be totally natural on closer investigations, so all I can say is to advise people to be sceptical and investigate both sides before judging. The evidence presented in Forbidden Archeology is overwhelmingly in favor of human presence on earth for millions of years, so none of this can be rejected simply because it conflicts with Darwin’s totally crackpot theory of evolution. Correct me if I’m wrong, but I’ve always believed that the scientific method requires that when evidence conflicts with theory, we must change the theory to fit the evidence. We can not diddle the evidence to fit the theory ! That is the tactic required by Plato, and we will never have real science as long as Platonists are allowed to hold any power whatsoever ! Plato’s definition of morality is one man, one job, and all prohibited by law from meddling in any subject outside that one job. Bicycle mechanics are not allowed to invent airplanes ! And amateur fossil hunters are not allowed to find prints of human shoes in Cambrian rock ! The criticism of the Meister shoe print is not based about anything scientific, the whole issue is that Bill violated Plato’s idea of morality ! The Great God, Charles Darwin, was a good Platonist, he strictly obeyed Plato’s requirement that only "dialectic" can be used, and all physical evidence cannot be considered. "So the summit of the intelligible realm is reached when, by means of dialectic, and WITHOUT RELYING ON ANYTHING PERCEPTIBLE, a person perseveres in using rational ( ???? ) argument to approach the true reality of things". Sorry if I offend people who worship Plato as a god, but I place physical evidence above all human opinion ! There is only one item in Forbidden Archeology that is certainly natural, it is the grooved metalic sphere following the item about the Meister print. There is a rock formation in east-central Utah where millions of these occur. I’m enclosing a photo of a sampling of these spheres, including how they look inside. I have no explanation of how these are formed, but they are natural. At least we can dismiss this item as relevant to human activity. As for Melvin Cook, he refused to look at the print ! His verdict is totally based on his own ignorance ! Bill told me that Cook announced on television that the print was just an oversized trilobite. Bill phoned him, offering to bring the print to his office so he could study it in person. Cook refused to see him, telling him that even if he did bring the print, he would not look at it. Cook expressed the classical Platonist verdict : "Don’t confuse me with facts, my mind is already made up". It is sad that Magin didn’t have sources closer to the facts. After 10 to 20 authors have each added their mistakes to mistakes of authors they copied, almost no truth is left to report. He quotes critics who dismiss the print as weathering, spalling, or fracturing of the rock. If he had known the true story, he would know that the print was never exposed on the surface for even a single day. Bill dug the rock from deep in a ledge, and found the print when he split it open on a natural seam between layers. The print itself is still in pristine condition. The squashed trilobite is NOT "wishful thinking", it can be easily seen in the photo, I’m also sending this photo to Magin so he can see it himself. Some criticisms in Forbidden Archeology are valid, but would never have been made if the critic had been closer to the facts. One of these states that "a true footprint should also show displacement or squeezing aside of the soft material into which the foot was pressed". NO ! If modern soil is wetted to the consistency for a shoe to sink as deep as this print shows, it will make a print EXACTLY like this, including the mud splitting at the toe as you push foreward to take the next step. It was never reported, but Bill found two other smaller shoe prints in much softer mud. One of these had sunk into the mud more than 3 cm, and the soft mud flowed in from the sides to almost cover the print. This also is exactly what we would expect for wetter mud. Because the mud flowed in from the sides, these two prints don’t look much like shoes, so Bill did not report on these, but he did keep the prints, which his wife now has along with the shallow one. I shot a photo of these, but the negative has been mislaid, so I can’t promise to send a photo, unless I can locate the negative and make reprints. One criticism where there is no dispute, is the need for a second print. This is the right foot, so Bill an I both agreed that we needed the left foot before we could call it proof. We made 3 trips to Antelope Springs to dig for more, but the rock is in the side of a cliff, and to have hope of an intact print being found, the rock must be peeled apart on every layer, like opening the pages of a book. This is extremely slow work, and we were never able to spare more than 3 days at a time, so we never reached the proper layer to find the second print. My involvement came when the television news reported on Bill finding the print. I contacted the TV station for his address, and wrote to him. Bill sent me the photo copied here, then visited a few weeks later. When he saw I was serious about finding the truth, he invited me to go with him to dig for more prints. Being a farmer, the summer is the busy season, snow blocks mountains in winter, besides being too cold for camping, so we were never able to use more than three days at a time. The first trip, Bill wanted to test my skill before trusting me with the correct location, so he directed me several meters uphill from the actual site. I found many good fossils, and hundreds of false prints, these are formed by thin deltas of mud being formed in shallow water. The leading edge of these will often be rounded like a heel or toe, but when more of the rock is opened, the true shape becomes obvious. It wasn’t until I developed the skill to peel open large slabs, to find these, that Bill trusted me with the correct location. Bill had shot a 35 mm slide on the day he found the print, showing the exact location. On the third trip he gave me this slide, so this was put in a viewer ; so I could look at the slide with one eye, the hill with the other, then move around until the two views matched. When I had located the exact spot, the reason for Bill’s caution became obvious. The University of Utah had been in there to deliberately butcher the site, hoping to destroy any remaining prints before they could be found. Instead of peeling the rock a layer at a time, like opening the pages of a book, the rock has been deliberately broken across the grain ! They didn’t even care about finding trilobite fossils, many good fossils were found in the shattered rock. I could have used dynamite with less damage ! But fortunately, the U of U diggers were too high in the ledge, so the proper layer was never reached, and all they did was to bury the correct site with their rubble. When I finally had cleared all their rubble, I asked Bill’s wife to stand there, pointing at the exact spot where the print was found, then I spot my own 35 mm slide so that I could return later if necessary. Bill died a few years ago, but his wife was still alive last Christmas. She has the prints at her home, so the actual prints are still available for use by honest researchers, if honest researchers can be found. She now is too old for camping in the mountains, so I’m now the only person still alive who can find the exact site, and after all these years, I’m even doubtful if I can find it again. When the third day came, and we realised we could never reach the right layer before time was up, I buried the exact site under several meters of rubble, then cut a careful excavation a short distance uphill from the site, in the hopes that if the University of Utah or any other sabotage efforts were repeated, they would dig too far above the site to damage it, and only put deeper rubble over the correct site. Even if I may never go back to find a second print, the correct layer will still be protected. Even if it may be many centuries in the future, the time will come when truly scientific excavation can be made, so I want the site protected until then. Fossil hunters will dig on the exposed rock rather than remove rubble. This is one subject where I’m more qualified than anyone to judge authenticity. Before I became a farmer, I worked for 11 years in a shoe repair shop, so if there is one subject where I am an expert, it will be the way a human shoe will show wear. From this viewpoint, it can be said in total confidence that whoever made this print was as human as anyone now walking this earth ! This was made by a shoe with a hard sole, such as leather or plastic, it was not a moccasin or any other soft covering for a foot. If you look at the photo with toe upward, the left side is the actual print made in the mud, this dried and became hard before fresh mud washed in to cover it, making a mold. The right side is the cast from new mud washing in. This is the right foot, as shown by two features. There is a bulge at the ball of the foot, at the base of the big toe, though the sole wasn’t cut in at the arch as we do now. The other feature is that the heel is worn on the outer back edge, just as modern shoes wear the heel here. The right edge is deeper in the mud, the left edge barely made a depression. The mud at the toe was cracked, as the toe pushed off to take the next step. The mud stuck to the heel on the inner edge, lifting it above the surface. The front of the heel was cut straight across, but is pressed foreward by flattening with pressure of walking, or possibly mud stuck to the front of the heel. The right edge of the heel has crushed a trilobite already in the mud, this curled up to protect itself, just as a modern bug will curl if injured. The cast has an imprint of this trilobite, the hole is easily visible. The cast also has another trilobite on the sole area, this is not curled, so it wasn’t injured. There is no corresponding hole in the mold, which proves the mold was already dry and hard when new mud filled the mold to form the cast. All things considered, this cannot be anything other than what it appears to be : the print of a human shoe. As for the source of this print, the obvious answer is space travellers from another planet. I hate to suggest this as a solution because many authors such as Erich von Däniken and Zecharia Sitchin have made such a mess of this subject, so critics automaticly tar everyone with the same brush, if they suggest space travel. This is not to say space travel is the correct answer for this print, but only that it’s the most logical answer. Lacking any proof for the answer, I’ll just give the evidence, ask the questions, then leave it to future research to find the answer. At least we must admit that space travel does not violate any laws of physics, which is more than can be claimed for evolution ! Darwin’s crackpot theory of evolution by natural selection is in obvious violation of dozens of the laws of physics ! While I’m thankful that Charles Lyell and Charles Darwin freed humanity from the stranglehold of church versions of religion, the ideas they gave to replace it are just as unscientific. If this shoe print does nothing else, perhaps it will provoke rejection of all existing theories, and prod research to find the reality. It will also be interesting to note that at least one species of trilobites is still living (...). Out of many hundreds of species of trilobites, some had forked tail, others had no tails, so the forked tail on these living trilobites is no reason to say this is not a trilobite. The only significant difference is the length of carapace. In the fossil trilobites, the carapace covers only the head, ending at the neck. In the living trilobite, the carapace extends to cover the body as well. Both are branchiopods, having either 11 or 13 pairs of legs, with gill structures alongside the legs. 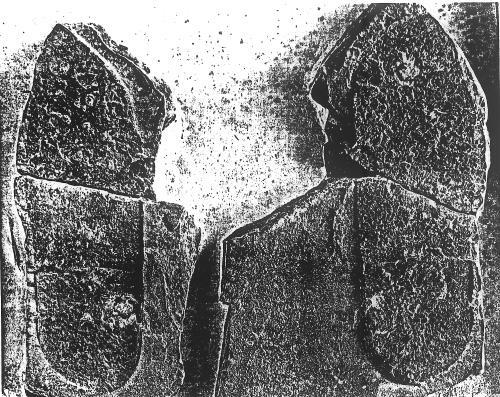 The fossil trilobites do not have a three lobed body as the name implies, it actually is a single body with legs so close together it looks like extra lobes. This is exactly what we see on living trilobites. If this species was found as a fossil in Cambrian rock, no one would blink twice over calling it a trilobite. Fossil hunters look for perfect specimens, but often the damaged examples are more informative. Photos of such damaged fossils show that the side lobes are actually the same legs as the living species ; and the head has a carapace that can become broken away. The fossil species has no tail, but the legs and carapace are clearly visible in these examples. What I find most fascinating about the living trilobite is that it reaches sexual maturity while still in its infancy. At only a few days old, they start to mate, and half produce eggs (...). The waste from digested food is excreted at the end of the longer tail. The Latin name of this creature is Triops cancriformis, more commonly called Apus, but it has many local names, including fairy shrimp, desert shrimp and many others. These inhabit potholes in deserts, which only fill with rain water on rare occasions. The eggs can lay dormant in the dry mud for decades, perhaps even centuries, then when the rare rain storms fill the holes, their entire life cycle can be complete in less than two weeks as the hole dries again. If evolution is possible, how do we explain these living fossils, which have existed with almost no change, since Cambrian times ? Let the Darwinists tell me how this creature still continues to exist, unchanged ? I could fill a book with proofs that evolution is impossible, but hundreds have already written such books, which have no effect on Darwinists, so why bother to add more ? We can only admit that it all is a matter of belief, and science has nothing to do with it. My hope is that by adding to the physical evidence, we will eventually collect such a mass of physical evidence that science will start to be used, and once we do use physical evidence, perhaps someone will find the truth.